When I got my first pack of reading cards from the creators at Piano Safari, the first thought through my head was “How can I create with this.” As my studio grew with these cards and each kid spent more time with them, activities, explorations, and games have arisen which presented the cards in a new light for me. Not only can the cards teach intervallic reading, but they can teach technique, feeling a pulse and rhythmic subdivision, sight singing, composition / notation skills, and improv. The Piano Safari cards start with fingers 2 3 and 4 in both hands and likewise coincide with the “Tall Giraffe” technique of the method which is non legato on fingers 2 3 and 4. This is a progression from the beginning of the method which starts on finger 2. I’ve loved using the first level (Pink) of cards to work on helping kids find a supported bridge, work on natural hand shape, balance on the keys, and find a nice bounce with their arm (see a good resource on this here). The cards eventually progress to using all 5 fingers and students can seamlessly transition to reading with all 5 fingers, while they transition to techniques like “Zecharia Zebra” which involve the whole hand. With young kids, often times I like to take the cards off the bench and incorporate movement, singing, tapping, and other tools so not only can they see the beat, they can feel it. One exercise we will do is take a single measure from the card, and stand and tap a steady beat on our legs or shoulder together, and then sing the measure back and forth while maintaining that steady pulse. The bottom line of the card, which is simply a rhythm line, is wonderful for rhythm activities that get kids moving, singing, and getting involved with the beat. When kids read the bottom line, often we will tap a steady pulse on our legs together, and we will sing the rhythms with a neutral syllable “bah.” Later, kids begin to associate rhythms with syllabic systems like Kodaly, Gordon, Takadimi, or similar. For a resource on why one would start with a neutral syllable and not immediately with syllabic system, click here. A game I like to play is lining up all the cards on the piano or on a table, and singing or playing lines in a row. We call it the “Caterpillar Game.” Kids love making long caterpillars! When a student is playing the cards, often I will make a large effort to incorporate their voice. I give them the starting pitch of the tonal pattern (in right or left hand) and then work on singing the whole pattern with a neutral syllable like “bum” without the piano. In addition, when students read the cards, they will sing the card while they play it in either hand, which helps connect the ear to the instrument. We sing the card back and forth with each other as an exercise, and help solidify the connection between eye, ear, and hand. Part of the process of the cards for my youngest kids is learning how to internalize rhythms and see how they are represented on the page. When they begin to have their reading abilities unlocked, creative opportunities begin to unfold both in their lessons and in their practicing. Many of my young students compose their own pieces, and when they try and represent these pieces with notation they do so with their current understanding. This manifests as shapes, symbols, or notes as in relation to the cards and where they are currently in the method. 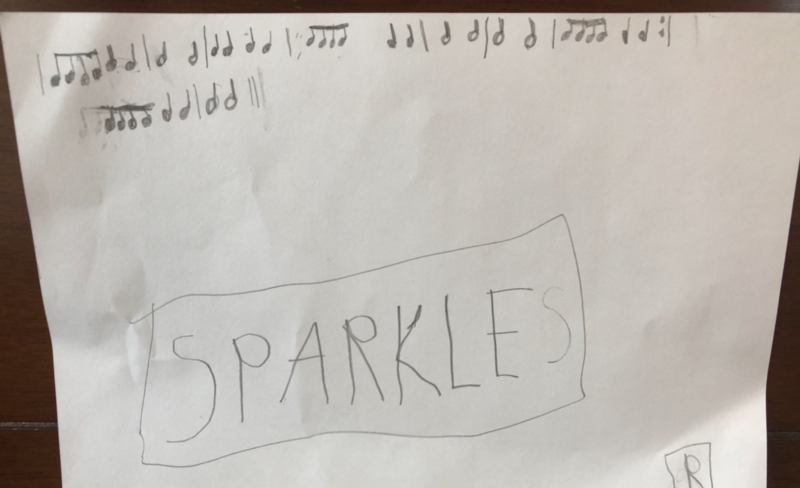 Below a student wrote her own piece based on her exploration with the cards, and then improvised the notes based on the white keys. As students build their sense of rhythm and their technique, their improv abilities grow and the cards are a prime opportunity for improvised exploration. The bottom rhythmic line can be filled in with improvised inventions of the student. Many students I’ve worked with take the bottom line and improvise compositions on the black keys, or on the white keys. In addition kids can sing a melody with the bottom line, or drum the bottom line, or we trade ideas back and forth. This concept of improvising off a score is paramount in more advanced stages of study. When I began to tap into the cards as a means for exploration and understanding, and went beyond just intervalic reading, the cards began to take on a new roll in my studio. Whenever I took out the cards my student knew it was time for an activity, a game, or time to create. Cards began to be a tool for working on not only reading, but skills that make up good musicianship. Certainly a welcomed addition and supplement to and studio and any method. Teaching Tips: Sometimes we just have to ask.